Cut from tool steel or stainless steel. 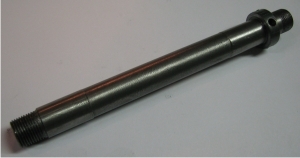 This is real Morse #0 spindle for UNIMAT! Not just a pin arbor. Instead of using difficult to find M12 accessories you can now use standard Morse type tailstock accessories. For example, nearly all of Sherline's MT0 tailstock accessories can now be used on an UNIMAT (LatheCity also offers some). The UNIMAT tailstock spindle is simply replaced by a Morse #0 spindle which takes 5 min. The front end still has M12-1.0 as usual. Use your old feed screw, M8-1.0 LH. Cut from tool steel or stainless steel.